We present one of the latest international projects of the Architectural studio A-cero led by Joaquín Torres and Rafael Llamazares. 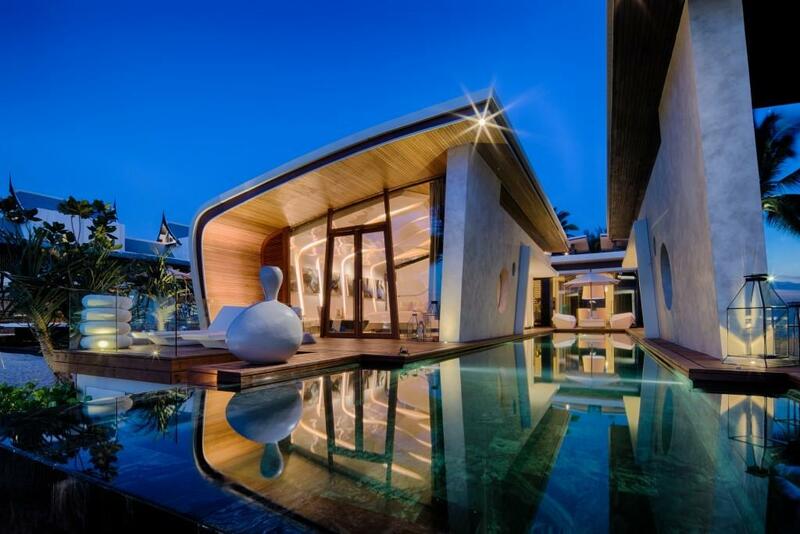 This project is an Interior Design development in an unique and exclusive hotel in Thailand. Located in the bucolic coast area of Natai Beach in Phuket, this place is characterized by its calm, the vast sands and the turquoise blue waters. 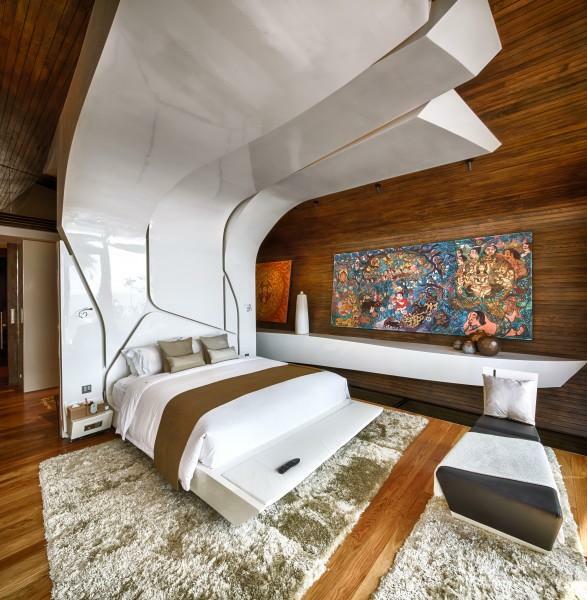 This little luxury hotel resort was conceived to enjoy your stay surrounded by good design. 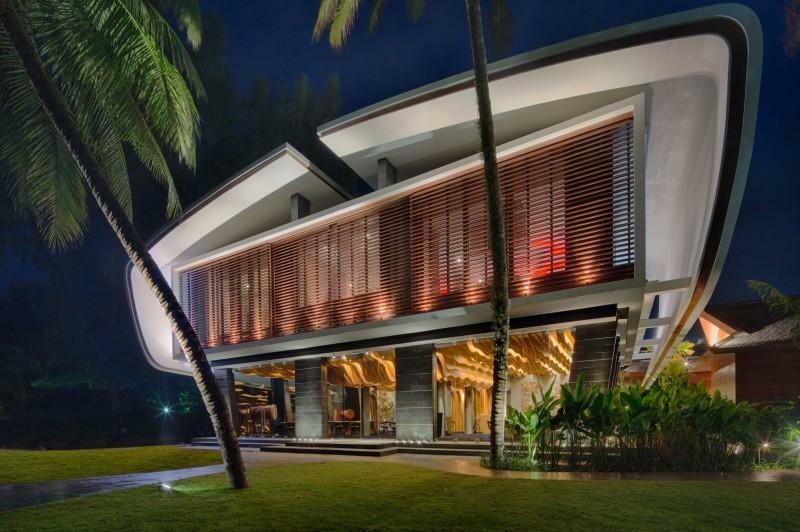 The complex has 10 villas designed by different well-known international architects firms. The project developer entrusted to A-cero the Interior Design of two rooms of one of the villas, concretely the Villa Bianca. Moreover, A-cero developed the design of the restaurant of the hotel, Aziamendi (with 3 Michelin Stars) as well as the exterior chill out area where you can enjoy the amazing views. A-cero have designed absolutely everything, even the furniture. Both rooms designed by A-cero are on the seafront. Two shell shape bungalows sharing an exterior swimming pool. Both elements play with each other and we tried to achieve the opposite interior design between them. In the first room, the vertical lines flow introducing into the sight of the visitor. In the second room the curved lines move horizontally embracing the space around. It is a game of vertical and horizontal lines that wrap the space. Looking for the “ying & yang” and different sensations for each other. The furniture of the rooms is born in each of the curved lines that create the rooms. The natural local wood is used for the floors and the walls of the rooms, looking for a natural environment according to the exuberant surroundings. In each of these rooms we have changed the disposition of the elements to make them different. The first room has light wood horizontal sense floor and dark wood ceiling. The project developer and the owner of the hotel trust again in Spanish professionals. For the restaurant they contacted with the recognized three Michelin stars chef Eneko Atxa, who has his local restaurant Azurmendi in Vizcaya, Spain. Once the proposal was accepted, the chef got involve with the project to implement the kitchen and the menu of Aziamendi, the name of his restaurant in Iniala. The design of a restaurant has created a welcoming place. In continuation with the style of the rooms, the restaurant has been designed with curved lines and natural materials. 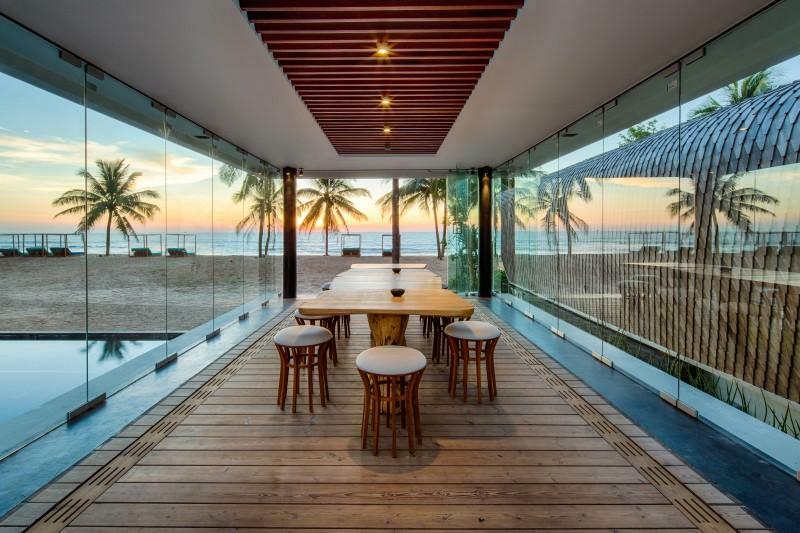 The fact that the restaurant is a glass box, allows the guests to view the surrounding landscape. The wood is used for the ceiling and the main walls. 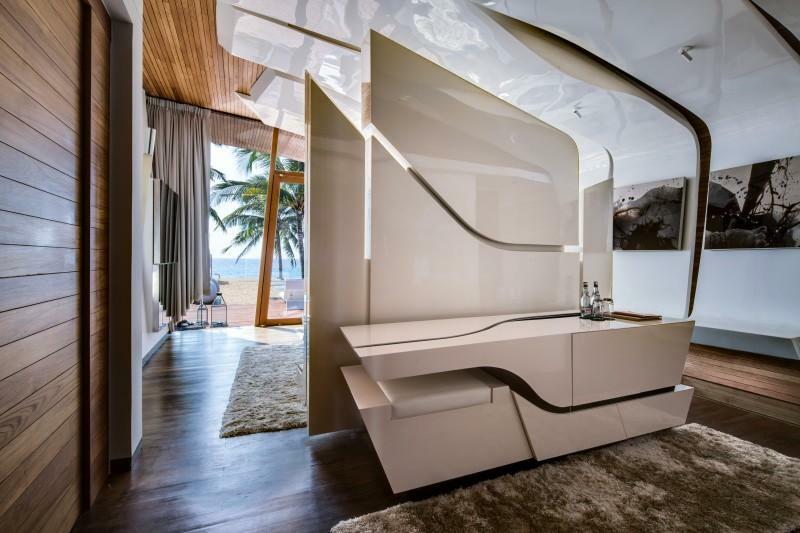 In this case we have designed different wood panels for the ceiling to simulate the movement of the waves. With the intention to maximize the form of each wood panel, the floor has been designed with light wood and the ceiling with dark wood.